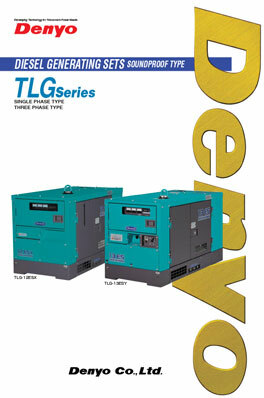 The TLG Series utilizes damper winding, Automatic Voltage Regulator (AVR) and coupled with latest alternator. The performance characteristics have been further enhance, as reflected by extremely low voltage regulation and minimal waveform distortion. Air trapped in the fuel system can be troublesome. Automatic air extraction features has become a standard for all the generator. Simply crank the engine to get your generator started. Daily maintenance and inspection can be carried out on one side of the machine. Radiator tank can be easily cleaned by removing the back cover. 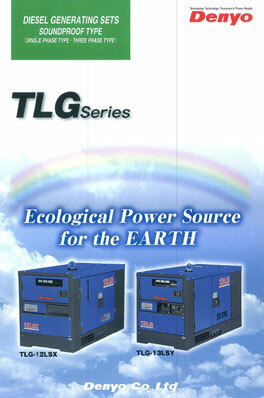 TLG high speed generator operates at low noise level. This has been achieved by using highly effective sound insulating materials and a unique duct construction, which is part of the advance cooling system developed by Denyo. The Engines used in these generators meet the Californian atmospheric pollution regulation, which is one of the world most stringent anti-pollution standards. This is achieved by these engine using PCV (Plug Control Valve) system. Therefore, these engines do not discharge blow by gas to the outside which keep the interior of the machine cleaner and exhaust emission are minimised.